The streaming box which is also known as, model number GX-SM530CF, will along with the aforementioned internet TV providers, will also support playback of local media files and offer cable TV services. Other handy features include a free remote control included that switches between cable and the web apps and services. 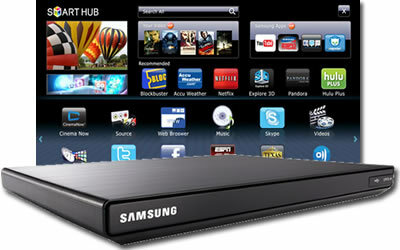 The box is also compatible with Samsung’s AllCast app so video can be mirrored from mobile to TV screen. The box will enter a crowded streaming box market that has just been joined by the cheaper CoStar-LT box from Vizio ($80), the Google Chromecast dongle ($35), along with the already established, Apple TV ($100), and Roku boxes ($59) amongst others. The set-top box industry is doomed to one day be replaced by TV’s that include all the internet connected functionality you will ever need, but for now Samsung are offering another albeit expensive option. The device is due to be launched on October 23rd. Verizon FIOS charges $4.99/month for an access card and from what I remember that doesn’t allow access to On Demand content or multi room DVR. Other cable providers are likely similar. Saving $5/month and losing those mentioned features is something to be considered.